There's a lot at stake for President Barack Obama in his battle to reform the health-care industry. In many ways, this very contentious debate is the House of Cards of his political legacy. Many believe that as goes health-care reform, so goes Obama. And they're right. Obama seems lost right now, and that's not a good thing for him, for Democrats or for the nation. 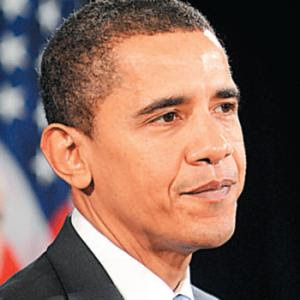 Obama has shown a general unwillingness to put up an aggressive fight for what he says he believes in. He's appearing weak, indecisive and without conviction. The health-care initiative seems on the verge of imploding, and with it will go the president's stock. The latest sign of trouble is the speculation that the White House could soon be dropping its once-essential "public option" from its proposed health plan, now referring to it as "not the essential element," as Health and Human Services Secretary Kathleen Sebelius said over the weekend. This is extremely disturbing, if true, for it shows that the president is bowing under pressure and compromising where he should not. Let's get straight to the point: Obama seems more concerned with peacemaking than reform-making. He seems more preoccupied with staying popular, despite his tanking approval ratings, than with pursuing an aggressive agenda of change; change which he was elected to achieve. For an incredibly articulate and bright guy he seems woefully unprepared for the health-care debate. He still doesn't get it that mere talking-points and likability just won't cut it against (a) a massively misinformed electorate desperately in need of specifics and plan details; and (b) a Republican Party hellbent on destroying him with lies and misrepresentations. To be sure, he's no George W. Bush, with whom I disagreed on virtual every domestic and global issue, but who demonstrated certitude when carrying out his agenda. When he wanted to march us into war, he did. When he wanted to use illegal torture and spying techniques, he did. When he wanted to lower taxes for the richest Americans, he did. When he wanted to take down political enemies like former Ambassador Joe Wilson, he did. He didn't care what Congress, the Senate or Democrats thought, and he never paid attention to public opinion polls. He was resolute and his precision was laser-like. He got the job done. No doubt, Bush was dangerous, insecure and impulsive. A reckless cowboy whose irresponsible actions we're still paying for and will be for some time. But, he fought hard and relentlessly for what he believed in, which is an awful lot more than we can say about Obama in his initial seven months. There is no better time for Obama than the present. The power and the bully pulpit of the White House is his. He also has the benefit of an overwhelming majority in the House and a filibuster-proof majority in the Senate. He still has the support of Americans, who elected him in a clear mandate for change. He's a brilliant politician and has the ability to rally people into his corner. There's still time for him to prove he can get the job done, but not much. With his rapidly dwindling popularity, and with voters growing increasingly frustrated by the minute, Obama needs to demonstrate and ability to lead and execute. He needs to be clear and concise with what he wants, and he must strong arm legislators--much as Bush did--to win their votes for his measures. He's got to grow some balls, for Pete's sake, and choose between being The Decider or The Waffler. Andy, you are so right! I feel we are being betrayed by the Dems and President Obama. They must pass health care reform with a public option (or at the very least bring it to the floor and let us all see who are the no voters). Without health care reform with a public option, the Dems are doomed. Their supporters will not vote in 2010 or give them any money. The best get it together and get it together fast! I'm happy to have a private insurer (or a public one) just as long as they are forced to accept me regardless of "pre-existing conditions" and "exclusions" ...and they charge by age. The public option is a side show, we need to put cost-containment first and pre-existing conditions second. We can't make young healthy people pay in, they don't want to. It would be great to get GOP buy-in so if they can get it, great. If the Democrats can't, they can't and should pass a bill that will infuriate the GOP. Obama can't fight the entire right wing media machine. He just needs to keep his 50 percent plus. With the economy quickly turning around he'll be back on top in no time. I believe he has followed a "peaceful " path to see if that works first. Let us not forget he is not controversial. But hopefully he is on a different course of action now. I am waiting to see. If he drops the public option, I am out of his support group. Period. If people do not understand the moral imperative of universal health care, the shame involved in being the wealthiest country that still treats health care as a privilege and not as a human right, then they cling to a status quo that is slowly imploding. BTW, many foreign newspapers are now reporting on the American health care system and they don't have nice things to say either for the system itself or the blinding stupid arrogance that emits from statements like "we don't want to be like France or Switzerland!" Jesus... is it so hard for people to google some stuff before they open up their mouths and embarrass us all? Pres OBAMA was elected without a resumee of any political accomplisments in the name of change.Shame on US.And whats a far left article w/out bashing former Pres Bush.Stop crying about illegal torture and spying.The Brooklyn Bridge is still standing and the NYC subways havent been hit. I'm completely agree with obama's thinking..
All of these complaints about Obama were made brilliantly clear during the campaign on the first page of the NY Times in an article about Obama's governing style. It made it clear that he wanted both sides to air the disputes, and then to work out a plan and finally to compromise in agreement. He was not pictured at all as an agressive leader but as a moderator in a two-sided debate. He facillitates. What is the big surprise. Weren't you people listening and watching and evaluating before you voted??? ?